==>> Process benchmarking – the initiating firm focuses its observation and investigation of business processes with a goal of identifying and observing the best practices from one or more benchmark firms. Activity analysis will be required where the objective is to benchmark cost and efficiency; increasingly applied to back-office processes where outsourcing may be a consideration. Benchmarking is appropriate in nearly every case where process redesign or improvement is to be undertaking so long as the cost of the study does not exceed the expected benefit. ==>> Financial benchmarking – performing a financial analysis and comparing the results in an effort to assess your overall competitiveness and productivity. ==>> Benchmarking from an investor perspective- extending the benchmarking universe to also compare to peer companies that can be considered alternative investment opportunities from the perspective of an investor. ==>> Benchmarking in the public sector – functions as a tool for improvement and innovation in public administration, where state organizations invest efforts and resources to achieve quality, efficiency and effectiveness of the services they provide. 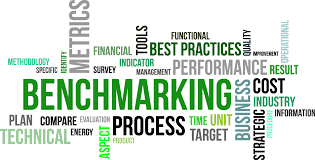 ==>> Performance benchmarking – allows the initiator firm to assess their competitive position by comparing products and services with those of target firms. ==>> Product benchmarking – the process of designing new products or upgrades to current ones. This process can sometimes involve reverse engineering which is taking apart competitors products to find strengths and weaknesses. ==>> Strategic benchmarking – involves observing how others compete. This type is usually not industry specific, meaning it is best to look at other industries. ==>> Functional benchmarking – a company will focus its benchmarking on a single function to improve the operation of that particular function. Complex functions such as Human Resources, Finance and Accounting and Information and Communication Technology are unlikely to be directly comparable in cost and efficiency terms and may need to be disaggregated into processes to make valid comparison. ==>> Best-in-class benchmarking – involves studying the leading competitor or the company that best carries out a specific function. ==>> Operational benchmarking embraces everything from staffing and productivity to office flow and analysis of procedures performed. ==>> Energy benchmarking – process of collecting, analysing and relating energy performance data of comparable activities with the purpose of evaluating and comparing performance between or within entities. Entities can include processes, buildings or companies. Benchmarking may be internal between entities within a single organization, or – subject to confidentiality restrictions – external between competing entities.